What are your shipping rates? We offer free domestic shipping via the United States Postal Service (USPS) to all addresses within the United States. 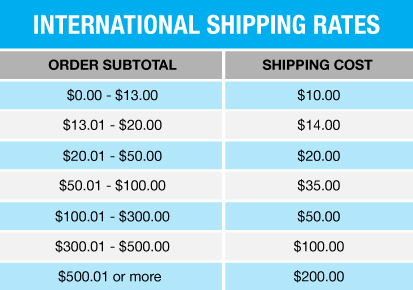 For a list of our current international shipping rates, please see chart below. Note: Shipping rates are subject to change. Will I receive my order? All orders are shipped via the United States Postal Service (USPS) from San Francisco, CA. Domestic packages can take 3-7 business days to arrive. International packages can take up to 2 weeks due to customs holding and transit. We will provide you with a tracking number upon shipment of your order. Fully Laced is not responsible for any processing delays, weather-related delays and/or strikes once orders are turned over to the United Postal Service (USPS). We also do not have any control over processing times with international customs agencies. Do you offer expedited shipping? Yes. If you need to receive your package sooner, you may add a Priority Mail Upgrade to your cart. Domestic packages can take 2-4 business days to arrive. International packages can take up to 2 weeks due to customs holding and transit. Do you provide tracking information? Once your order has shipped, you will receive a shipment notification email, which will contain the tracking number for your package. Please allow 1 business day for the tracking information to update.